Kent Hovind & His 300! – Kent Hovind v. Robert Baty – The Great Debates! Home→Kent Hovind & His 300! Kent Hovind & His 300! 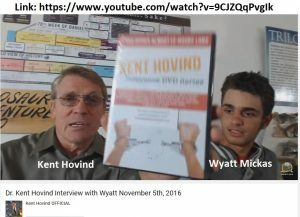 Kent Hovind, in his Sunday, November 6, 2016 performance, around the 4:50 mark as indicated by the following time marked link, announced that Nydia Rivera is being identified as the first person to follow the instructions in Kent’s “Kent Hovind Innocence DVD Series” and send in the mysterious 26 page signed affidavit to some unknown, unidentified government official(s) at some unknown, unidentified address in hopes that there will be some kind of government investigation that will result in Kent Hovind’s 2006 convictions being reversed and him being awarded up to $30,000,000.00 in damages in addition to having Judge Margaret Casey Rodgers impeached……..or at least in hopes that the scheme will begin a new income stream for Kent Hovind as the series is being advertised as available for $50.00 a set. I will likely need some help to keep this list up to date. This list will try to document the known “300” who have been willing to publicly claim that they have done what Kent Hovind has asked them to do in his video series. For some days now Kent Hovind has been touting the website http://kenthovindisinnocent.com/ for more information on his scheme, and the dvd series has been shown to include a reference thereto. To date, I have not been able to find a website with that address that is operational. No explanation was given by Kent as to why more of his compound residents, or other close associates, have not sent in the documents as proposed in the dvd series. I await notice as others might publicly acknowledge their taking part in the scheme and as more details of the scheme might be revealed. Nydia is a long time resident at Kent Hovind’s compound in Conecuh County, AL where he is building his retirement village and recreational playground with a dinosaur theme. 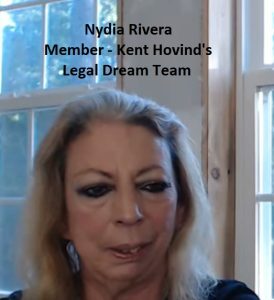 Nydia has also been touted by Kent Hovind as being a member of his “legal dream team” along with Brady Byrum who is the mastermind behind the dvd series.